Pudina (Mint) chutney is a very tasty dish. 1. Cut tomato and onion into medium size pieces. 2. Put oil and fry onion n garlic. 3. Add tomato and saute. 4. Wash and add Mint leaves, red chilli and saute. 5. Cook all till raw smell goes. Cool it. 6. Grind in mixie with salt to fine paste. Yummy Pudina chutney is ready. Serve with Samosa, Kachori and other dishes like idli and dosa also. Adai is one other typical South Indian Breakfast/Tiffin item. It is like dosa but different in taste prepared with paruppu(dal). · Soak rice and dhal in water over night. · When soft, grind it coarsely with red chillies. · Though thin paper roast Dosas can be made with the smooth batter, in general the batter for Adai has ingredients not ground nicely. This still gives the nice brown crispy texture. · At the time of making Adai, you can use one of these as additional ingredient (I repeat only one of these and not all together) to get different flavors to your Adai. · Another alternate is that, instead of Red Chlli you can use Black Pepper and in that case again sliced Coconut can be added. · If you are looking at Murungai Ilai, do not add Pepper or Coconut but you may wish to add onion. Try not to add more leaves as some do not like the weired bitter like taste. Adai can be prepared without any of these extras but if you want your taste buds to try different, then add these ingredients only when you are making the Adai and not before. This helps the basic flavor of the batter remain the same and that the freshness of the additional ingredients. Preparation:· Add your desired extra toppings and also the curry leaves. · Heat the pan a little more than medium, season it with half spoon of your preferred oil. · If your pan is nonstick type, then no need to season it but you can straight away start making Adai. · Remember that since the batter is not smooth and the consistency is thicker than that of Dosa, this needs to be cooked a little longer than Dosas.
. To make the corners crispy, add little oil to sides. you can also make a little gap at the middle and add little oil to make it crispy too. Turn the adai and cook reverse side. · Adai with Avial is the best. For Avial check for recipe just click Aviyal· Adai with butter cube. 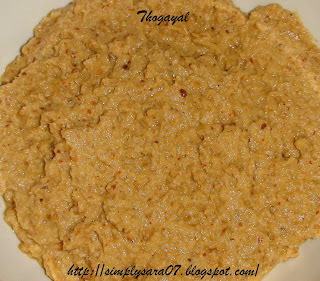 · Some people like my husband eat it with Jaggery and thick fresh Yogurt. Kadai Mixed Vegetable is a very tasty gravy prepared with vegetables and spices. A side dish for chapathi, naan, rotis…. Soak Cashews in water for 2- 3 hours and grind to a fine paste. Cut tomato and onion into small cubes. In a Kadai, put 2 tspns oil, put pattai (cinnamon), fry for a minute.Add onion and tomato fry for 2 mins then grind all in mixie to a fine paste. Wash thoroughly and cut vegetables into medium size. Steam in cooker without putting whistle for 15mins. So its almost half boiled. In a kadai, Add 2 tspns oil, add pattai, elakka and anasipoo (spices) fry for a minute now add paste of onions and tomato keep stirring for sometime. Now add chilli powder, turmeric, garam masala and stir well. Add cashew nut paste and allow it to boil well. Add vegetables, salt and mix well. Add water if required and boil till all masala gets into vegetables. Kadai Mixed Vegetable is ready to serve. Vangibath is a tasty rice prepared with Brinjals. Its popular in Karnataka. Cook rice and keep separately. Cut Brinjal into length wise pieces and put in water. In a thick bottom kadai, add oil, mustard wait till it splutters. Put Bengal gram and wait till it turns brown. Now add the Brinjals and cook. Once its cooked add vangibath powder and fry till raw smell goes. Allow it to cool and then mix with rice and serve. Vangibath is ready to serve. It can be had as it is or with curd. UPSET STOMACH? EAT BANANAS - GINGER!!!!! Ghee - 1 /2tspn(Optional) If we use ghee it will be very tasty. Cook toor dal in pressure cooker. In a vessel, add tamarind water, plain water, tomato(optional) and rasam powder. Allow it to boil till raw smell goes . Now take toor dal add little water to it and blend well. Add it to tamarind water and boil well. Add salt, grated coconut and jaggery. Season it with ghee, oil, mustard once it splutters add asafotida. Rasam is ready. Serve hot with rice along with any curry or fried papads/chips. Note - Check on salt once you season with ghee salt will reduce. Sepan Kizhangu(Taro) dry curry is very tasty and simple to make. Sepan Kizhangu is a root vegetable. Wash Sepan Kizhangu and cook in pressure cooker for about 3 whistles time. Add the desired quantity of salt at this time itself so that the salt gets absorbed in. Wash in cool water and peel the skin. Slice into 1 inch pieces. In a kadai, put oil, mustard (allow it to splutter) then add turmeric and asafotida. sepan kizhangu and fry for 2 mins. red chilli powder and mix well. Roast well till it turns brown. Crispy Sepan Kizhangu dry curry is ready to serve. It will be very tasty with rasam rice. Note - If it becomes very sticky sprinkle 1 or 2 tspns rice flour and fry. Prevent buildup of fatty deposits on artery walls with regular doses of tea. (actually, tea suppresses appetite and keeps the pounds from invading....Green tea is great for our immune system)! 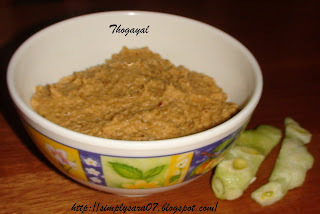 Podalangai(Snake Gourd) seeds Thogayal (Chutney) is prepared with the seeds of the vegetable. Its good when Podalanga(Snake Gourd) is tender and fresh. This is popularly prepared by people in South India. Cut Podalangai lengthwise. Remove the seeds and keep separately. In a kadai add cooking oil, uzhatham parappu, dry red chillies and fry till brown. Transfer it to a plate to cool. Now add little oil to the kadai and fry the seeds till raw smell goes. Grind in mixie the above with grated coconut and salt to form a coarse (not smooth) paste. Podalangai Thogayal is ready to serve. This can be used as a side dish for Kootu,Chapathi, Poori and along with meals. It can even be mixed with rice also. Badam Milk is very tasty and healthy drink. Badam is rich in Vitamin E. Its very refreshing drink. Soak Badam in hot water for 1 hour and remove skin. In mixie grind Almonds and pistachos with little milk to fine paste. Heat milk, add Elakka powder and this fine paste. Boil well. Mix kumkumpoo milk and add required sugar and off the stove. Garnish with pistacho flakes and kumkumpoo. Enjoy the drink hot or chilled. 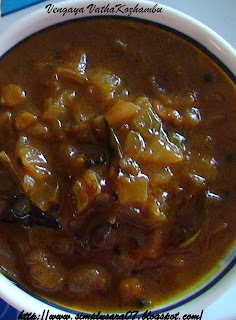 Vengaya VathaKozhambu(Erulli Gojju in Kannada language) is a thick spicy gravy of onion mixed with tamarind water. This is one of my mom's best recipe. This is very simple and sweet. This is popular and frequently prepared in Karnataka, India. Soak tamarind in hot water and squeeze it. Filter and keep the water. Heat kadai, put oil, mustard wait till it splutters. Add asafotida and kadala paruppu/uzhatham paruppu saute till brown. Now add chopped onions, little salt and saute till soft. Add tamarind water and allow it to boil. Add sambar or vathakuzhambu powderand boil well till raw smell goes. Now add curry leaves and jaggery and stir well. Keep it in medium flame till it becomes thick in consistency. Taste and see add salt if required. Yummy Erulli Gojju is ready to serve. This is a good combination for chapathi or rice. Tips - If it becomes too watery, mix 1 or 2 tspns of rice flour in little water, add this to vathakuzhambu and allow it to boil till you get the desired consistency. 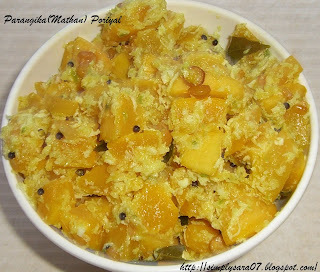 Parangikai (Mathan) Poriyal - Sweet or Yellow Pumpkin is very colourful. This vegetable curry is very tasty. It is simple and very easy to prepare. Remove skin and seeds of the parangikai. Cut into small cubes. Heat a kadai, put oil, mustard wait till it splutters. Add asafotida and kadala parap/uzhatham parap saute till brown. Add the cut parangikai sprinkle little water, salt and cook it. Check whether parangikai is cooked soft do not over cook. Now add curry leaves, coconut and green chilli mixture mix well. After 5 to 10 mins off the stove. Parangikai poriyal is ready to serve. Notes - Cut Parangikai to medium size, cutting very small while cooking it will overcook and become paste.